Repels and kills fleas, ticks and mosquitoes. Begins working within 12 hours and kills pests on contact. Kills all life stages of fleas to prevent re-infestation; also kills lice and even repels biting flies. Waterproof formula continues working for up to four weeks, even after bathing or swimming. Convenient, monthly topical application contains imidacloprid, permethrin and pyriproxyfen. K9 Advantix? II is a convenient monthly topical application that kills and repels fleas, ticks and mosquitoes. 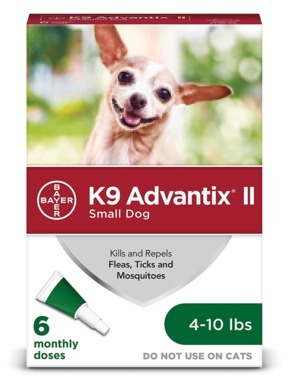 It's specially formulated for dogs with imidacloprid, permethrin and pyriproxyfen for broad spectrum protection against these ectoparasites that can transmit diseases. K9 Advantix? II is for use on dogs 7 weeks and older and weighing 4 lbs. or more. K9 Advantix? II kills fleas, ticks, mosquitoes and lice, and repels biting flies. And because it works through contact, there?s no biting required. Do not use K9 Advantix? II on cats. There are no reviews for this item. Be the first to write one!